Missing teeth can compromise your ability to chew, your appearance, and the ability to properly enunciate your words. Fortunately, implant-supported dentures can fully resolve these issues. Advanced Dental Health in Phoenix, AZ, provides custom implant dentures to restore the comfort, health, and functionality of your smile. While traditional dentures rest on the gums, held in place with a combination of mild adhesive and suction, implant dentures are anchored directly to the jaw, just like your natural teeth. This prevents your dentures from slipping out of place, allowing you to chew and speak with total confidence. To learn more about how you can benefit from implant-supported dentures, contact us today and schedule a consultation. Working with many dental specialists in the area, our doctor offers comprehensive dental implant treatment, planning and performing every step from beginning to end. Dental implants are titanium posts that replace lost tooth roots and provide the ultimate anchor for a range of prosthodontics, including dental crowns and bridges. Implant-supported dentures fit securely and will not slip out of place, allowing patients to bite and chew all types of foods, speak clearly, and project an absolutely natural-looking smile. Meanwhile, dental implants are the only restorative solution that can prevent the bone atrophy that follows tooth loss. 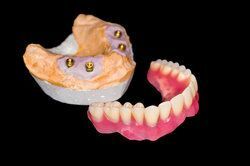 While traditional dentures require periodic refinement to accommodate changes in the jaw, implant-supported dentures rarely need adjustments because the jaw maintains its size and shape. In addition to the functional benefits of implant dentures, jaw tissue retention makes this option one of the wisest investments you can make in a compromised smile. Created using artfully layered porcelain, our dentures look completely natural. Your bite plays an important role in your facial appearance, and lost teeth can cause your features to lose definition around the lips and lower cheeks. Our custom dentures are not only designed to provide you with restored functionality and health, but also provide aesthetic harmony. Working with many dental specialists in our office, we offer comprehensive dental implant treatment, planning and performing every step from beginning to end. Before recommending implants, our doctor will carefully evaluate your candidacy. If for any reason you are not a candidate for dental implants, he will offer you the best alternative solution to restore your smile. Implant surgery is performed in our office using local anesthetic and oral sedation to ensure your comfort. Once your dental implants are in place, the doctor will provide a temporary restoration to use while you heal. In three to six months, your implants will completely fuse to the jaw in a process called osseointegration. At that point, the doctor will place your permanent denture, carefully created to achieve an excellent fit in every respect. We will then ask you to come back to our office once your Invisalign® trays have been made. Your doctor will give you specific instructions for your care when you receive your trays. A series of follow-up visits will also be scheduled during this appointment, so that we can check in frequently to ensure that your Invisalign® treatment is progressing as expected. At Advanced Dental Health, providing patients with state-of-the-art dental solutions is our mission, and we strive for the best possible results in each and every case. We have helped many patients achieve a better quality of life with implant-supported dentures. If you are suffering with missing teeth, and wish to achieve a fully restored smile, contact our office today and schedule a consultation.